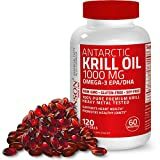 The Viva Naturals is our pick for the best krill oil supplement, which has a total of 1,250 mg of krill oil per bottle and is known to be much more powerful than fish oil. It has a total of 60 capsules in one bottle and contains 165 mg of EPA, as well as 95 mg of DHA for better memory retention and brain performance. Additionally, the well-renowned omega-3 fatty acids are present. Our step-up pick is the Onnit Extra Strength and it also contains the essential fatty acids that are needed for better heart health. It contains 60 soft gels that are easy to take and are ensured pure and fresh from the manufacturer. It has been extracted from the icy cold waters of the Antarctic and the sea creature can be an ideal source of omega-3 fatty acids. The budget pick is the MegaRed Extra Strength and it contains a total of 90 soft gels in each package, containing 500 mg of pure and easy to swallow supplement in phospholipid form for ease of absorption to reduce the risks of heart problems, like coronary heart disease. Like every similar product out there, it also contains omega-3 fatty acids that are good for the heart. Krill is a kind of shrimp-like creature found in many oceans around the world. This kind of creature looks like a shrimp but is actually a different creature. It is known as the euphausiacea and has been hailed with properties similar to that of fish, and that is why it can be used for food consumption and as an extract for health benefits for various parts of our body. This shrimp-like creature can be a source of omega-3 fatty acids, much like fish. Omega 3 fatty acids are important things and nutrients that can potentially boost your heart health overall. It is also a great source of power and endurance, especially for adults and seniors with tendencies for heart problems, and will be a great thing to have to keep them healthy despite being in old age. You can purchase authentic euphausiacea extract from various drug stores and herbal stores. This kind of product is usually produced from factories but not all of them are authentic. Some do have valid sources of euphausiacea extract but others are fake and are imitation products and you do not have guarantee over its pureness as a euphausiacea extract product. It is better to ask your doctors or medical experts in town as to which ones are authentic and which euphausiacea extracts are considered fake. Like most extract herbal medicines out there, you should remember that euphausiacea extract is not meant to cure a disease or sickness but can help alleviate it, hence the "no approved therapeutic claims" you mostly see on TV advertisements for extracts and herbal products. It is not something that will cure your heart disease, rather, it will help alleviate using the omega 3 fatty acids that are contained in it. Sure it really works, but you have to do some effort like exercise and a healthy lifestyle as well. One should be careful when purchasing herbal medicines out there and see if they are authentic. It can be verified if it us an FDA approved euphausiacea extract so that you know it is not fake and the FDA has verified what kinds of ingredients have been used in making the product. This also means that you are assured that the way they make the euphausiacea extract product is through safe means. This also signifies that the factory passed the national or world standards in safe food and extract production. While there are many dietary herbal capsules out there, they only add to your daily lifestyle and you should manage your physical health first. Do check with your doctor or physician first if the euphausiacea extract is okay to intake. Some people may have different reactions to various kinds of herbal products, and no one is exception to the rule. It depends upon your genetics and environment, so you should ask a doctor first, especially if you are pregnant or taking other medicines. Authenticity: make sure that the euphausiacea extract is legitimate and from a reputable source so that you will know that the product is authentic. Many other marketed, labeled and cheaper euphausiacea extracts out there are not authentic and are only made of food coloring and not real extracts so be wary of them. You should have proof that they really are from euphausiacea out in the sea. Amount of capsules: the euphausiacea extract can usually come in a bottle of capsules, all varying in their amounts of capsules depending on the manufacturer. Much like fish extract, they can range from 60 to 1,000 depending on the size and price. More capsules mean that it will be an expensive euphausiacea extract to buy for yourself, so you should pick a size that fits with your budget. Milligrams: this also indicates how many milligrams in each euphausiacea extract capsule are there, and the container as a whole. The milligrams can be a deciding factor when it comes down to the euphausiacea extract and its overall content. Ease of taking: you should be able to take it with ease so that you will not feel bad or bloated when it comes down to taking the euphausiacea extract. Many people fear and have phobia of taking capsules because of how large they are and most swallowing issues, especially for seniors. This is why they should be easy to intake so that you will feel healthier without the worry of choking. Price: the price can also be a deciding factor with buying any euphausiacea extract. Do remember that most extracts and herbal products that are authentic are usually higher priced than the fake ones, so you can be able to tell the difference if the extract is fake or not. It takes many machineries and effort by workers just to obtain the euphausiacea extract so you should know that they will most likely be not cheap in price. FDA approved: a good shopper knows that FDA approved products are the ones that are safe to consume and to use overall because their product ingredients have been thoroughly checked for safety and authenticity. This is an important factor when deciding for the best euphausiacea extract out there. As our top pick, the Viva Naturals is a supplement that contains 1,250 mg of sea creature oil, that comes in easy to swallow capsules, amounting to a total of 60 in one bottle. The phospholipid form makes the absorption of the omega 3 fatty acids better, and thus, it can help you with your heart health. It also contains a total of 165 mg of EPA and 95 mg of DHA in each bottle. Aside from maintaining a healthy heart, it can also keep your joints flexible and it will be a good aid to fight the bad effects of bad cholesterol to your overall health. The banded capsules also reduce the revolting taste that most fish capsules have. For a youthful appearance and feeling, there is also an antioxidant called astaxanthin that is present in the extract. The capsules are very easy to swallow and can also potentially help reduce inflammation. The only con with the Viva Naturals that is not a deal breaker is that it may have a little fish scent, but that is normal for most krill oils anyway. Besides, that is the way to prove that it is authentic krill oil. The Onnit Extra Strength is our step-up pick, which comes in a bottle that contains 60 soft gels that are ready to be consumed, much like fish extract. It contains 1,000 mg in total and contains omega 3 fatty acids which are good for your health and your heart. It also contains EPA and DHA for a better brain performance and memory retention. It is strongly beneficial for your cardiovascular, heart, and joint health overall. An international organization called Friend of the Sea also verified that the source of this sea creature extract is from a more sustainable source than other types of extracts from the sea out there, in which these uniquely sustainably gathered sea creature extracts come from the icy cold waters of the Antarctic. Most people have switched over from regular fish oil because it can also help with your joints, especially for people with arthritis problems. 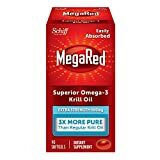 The MegaRed Extra Strength is our budget pick, which can help reduce the risk of coronary heart disease due to the inclusion of the omega 3 fatty acids, which is much like in fish oil, but is easily absorbed due to coming in phospholipid form in the product. It contains a total of 90 soft gels all in all and has 500 mg in total for one pack or container. Unlike others, you will get less fishy odor or aftertaste. This product also comes with astaxanthin, which provides benefits for your inner body cleansing due to the antioxidant properties. It has EPA at 64 mg and DHA at 30 mg, plus astaxanthin at 25 mcg in a single soft gel serving. The lighter, more translucent appearance also makes it easier to digest, and thus, it will work much quicker than other OTCs out there. It does not present a kind of gastric discomfort that is the problem of certain extracts. Renew Naturals is a great extract that you can go for if you frequently have PMS symptoms, as it can help you calm down and alleviate those. Each serving ahs 1,000 mg of extract and also has omega 3 fatty acids to keep your heart health to the best level. Each bottle contains 60 soft gels that are easy to take. It can also help you to enhance your brain performance and memory. Like most extracts, it can also have good effects on your joint health and on your regular heart rhythm. It may also significantly keep the blood pressure and cholesterol levels to a normal range. The facilities that made this product are also CGMP-compliant so that you can be assured that it is of quality production for the consumers. A ECO-Harvesting system method has been used to make sure that it is coming from sustainable sources. If you want something that has astaxanthin, you can go for the Bronson Antarctic, which has that. It contains 1,000 mg per serving and has a total of 120 soft gels in each container. It also contains the usual EPA and DHA as well as the omega 3 fatty acids, which are beneficial for your heart health. It also supports your joints other than your heart. As for the extract, it has been sustainably harvested in the waters of Antarctica. As a beneficial extract, it can potentially set your cholesterol levels to a healthy line, and the extract also potentially helps to reduce blood pressure in the long run with regular intake. It is also significantly smaller than fish gels and capsules so it is a lot easier to take. The astaxanthin can work well to prevent your skin from getting damaged and it can also help to lift your mood. 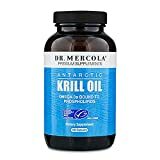 The Dr. Mercola Antarctic is an odorless formulation that contains 180 capsules in the container. It has omega 3 fatty acids that has been bonded to phospholipids to make it better and easier to absorb, it can be easily taken at only 1 serving per day ,which is less of a hassle. Like other extracts of this kind of sea creature, it also has beneficial EPA and DHA for your brain health. If you feel stressed out at work and lack creativity, this kind of capsule can help you to get a better mood and also attain an improved concentration whenever you work on a certain task. There are also absolutely minimal or no fishy burps or rancid smells that are present because of how it was made without fillers. As a quality product, it is also free from GMOs, soy and gluten for those with special kinds of diets. A popular contender in herbal medicines out there and supplements, the NOW Neptune comes with a total of 60 softgels in each container. It can help with cardiovascular support as well as with its antioxidant to refresh your body. It will also be beneficial for those with arthritis because of how it easily supports your joint health. And because this product is enteric coated, there will be less likelihood of a fishy smell. The omega 3 fatty acids that are present in this product can potentially help maintain healthy blood lipid levels and act as a good immune-supporting antioxidant for your body due to the presence of astaxanthin. Each container and gel has a total of 1,000 mg in each, and has gone through rigorous testing and standards to make sure each of them are of quality production and will cater to your health while being easy to swallow. For those with concentration problems at work, you can try the Pomme Green Nutrition, which is an FDA approved formulation that is also non-GMO so it is healthy and pure. It is also made in GMP certified laboratories and is quite easy to digest all in all. It is a set of 60 soft gels that contain 1,000 mg each with omega 3 fatty acids to help with your heart health and also for balancing your cholesterol. Aside from your heart health, it also boosts your body’s functions by reducing inflammation in the body and helping your joints and brain to recover better. It comes in tasteless soft gel form that does not have a bitter after taste as compared to others. It can do more than just lowering your cholesterol – it also pays attention in improving your brain health/joints, while being easy to be absorbed by the body due to being delivered in phospholipid form. If you want a third party tested product, the Natrogix Antarctic might be a good choice for you. It comes with 123.5 mg each of omega 3 fatty acids and astaxanthin at 420 mcg. It has been known to help alleviate joint pain and inflammation and this will be beneficial to the elderly in that case. It contains 1,500 mg of pure sea creature extract that has been sustainably harvested and adhering to the CCAMLR for harvesting. You also get enhanced cardiovascular benefits with this kind of product, and it will definitely a much better upgrade than standard fish extract alone. To store it, the capsules don't need refrigeration – just make sure that they stay in a cool place that is not exposed to direct sunlight. Most people will find them very easy to swallow due to the simple size and shape. It is also water soluble, which can help to alleviate stomach upsets. For those with memory gap, the Jarrow Formulas may help alleviate your memory problems with the extract from the sea creature. It contains a total of 30 soft gels in each pack or bottle and each of them contain omega 3 fatty acids along with astaxanthin and are delivered through phospholipids form for faster absorption for the body. Women with menstrual discomforts can also count on this kind of product for their mood swings. Those with lack of focus and brain function problems and those with heart health problems can benefit from the omega-3 PUFAs that are contained in this product. The extract has gone through a multiple stage process to ensure that it is of quality source from the Antarctic. The harvesting method also meets the standards of the Convention for the Conservation of Antarctic Marine Living Resources (CCAMLR) to ensure eco-friendly and sustainable harvesting. Moreover, the product facilities are also cGMP certified. Other euphausiacea extracts did not make it to our list because they had problems with their labeling and packaging that may mislead people. They were also not FDA approved so they might not be safe enough to consume or use as euphausiacea extract. Q: What is euphausiacea (krill) natural extract? A: Euphausiacea natural extract or krill oil is a kind of herbal product that comes from the euphausiacea, which is a sea creature that can be found in the Antarctic. It is known for its content of omega 3 fatty acids, which can help with heart health, as well as its content of EPA and DHA, which can help with your brain performance. It is known to be much better than fish natural extract in terms of ingredients and nutritional levels. Q: What are the benefits of euphausiacea natural extract? If you ever feel that you are lacking concentration and brain performance then you can count on euphausiacea natural extract for this job due to the inclusion of DHA and EPA which is found in the omega 3 fatty acids. You can definitely count on the euphausiacea natural extract that you have with its omega 3 fatty acids that can help with your heart health and cardiovascular health overall, especially for the elderly who may have heart problems. If you are more prone to memory loss as well as having the risk of Alzheimer’s then you should definitely try euphausiacea natural extract due to the inclusion of vitamin D in most cases of this euphausiacea natural extract to make you remember things better. As compared to fish natural extract, euphausiacea natural extract is something that works faster because it uses phospholipids that makes it easier to be absorbed by the body. In this case, this is why euphausiacea natural extract is much more popular nowadays than fish natural extract. The problem with most people who intake fish natural extract is that they do not like the taste and the smell. However, with euphausiacea natural extract, the taste and the smell is diminished so that you won’t have to endure the pain of foul smelling fish. The omega 3 fatty acids are converted into eicosanoids and this can have properties that can reduce inflammations on your body, inside and out, as coming from natural and sustainably harvested euphausiacea natural extract. This can help to keep your body balanced and cleansed so that you will feel good inside and out. This kind of antioxidant is mostly found in sea creature extracts, such as in euphausiacea natural extract and crustaceans. Because euphausiacea do not feed on anything containing mercury (they only feed on phytoplankton), the euphausiacea natural extract that you may have will not contain metals and be safe to intake as compared to fish natural extract. Those who are pregnant can actually benefit from euphausiacea natural extract, as it will help to improve the brain development of their future child. Sustainable harvesting of euphausiacea is super easy unlike other types of fish and aquatic animals. The problem with other kinds of fish natural extract is that they are not always sustainably harvested and there could be limited supplies when the weather is bad, or when the species are being threatened. As compared to that, fishing for euphausiacea natural extract is just fine because of the great abundance it has. Due to serotonin and dopamine boost because of the omega 3 fatty acids, euphausiacea natural extract is known to alleviate bouts of depression and bad moods. These two components can help you to get started throughout the day. Q: What does euphausiacea look like in terms of anatomy? The average size of a euphausiacea is about 2.5 inches in length. The average weight of a euphausiacea is less than an ounce, more specifically about 0.7 ounce. It looks like a shrimp with large, black eyes and a pointed head shape. In the tail, it also looks similar to the shrimp with feather like legs and tails that have segments. The euphausiacea is somewhat more transparent than the shrimp, allowing you to see its digestive system easily. It looks a bit green because it is a vegetarian. Compared to the shrimp, the legs and claws of the euphausiacea have additional ones on the head, primarily for gathering food, which is mostly plant. Q: Where is euphausiacea found? A: Euphausiacea is found mostly in the southern ocean and usually in swarms of about 500 million tons. They usually swim together because they are so small, but when they are swallowed by giant whales, they are also swallowed in unison. They spend more time at night in the surface and more time at the bottom of the ocean during the daytime. This is most likely to avoid encountering whales and similar predators at hand. Q: How is euphausiacea natural extract made? Harvesting occurs in the deep waters of Antarctica, in which most of the euphausiacea live and thrive. If you want to buy euphausiacea natural extract then you should make sure they are sustainably harvested by global standards and certified ways. A technique called freezing right after harvesting can make the euphausiacea keep its nutritional value. It is therefore much better to harvest euphausiacea during the summer because they hibernate in the winter. The extraction is usually done using a cold vacuum process to keep the omega 3 fatty acids that are not ousted in the whole process. Phospholipids and astaxanthin are not removed as well. All of the important nutrients are kept. The natural extract is finally packed properly in capsules, or more recently in soft gels, so that they can be taken easily. Once packaged into their containers, they are shipped to the stores and right to your doorstep if you wish. Q: What are differences between shrimps and euphausiacea? Shrimps only have two major parts: its head and abdomen. Their thorax is fused to their head. They are also more opaque in their skin. They are generally bigger than euphausiacea. Euphausiacea are made of three major parts: the head, thorax and abdomen. They have a mostly translucent body skin so you can see their digestive system. They are generally smaller than shrimps. Shrimps are very good at laying eggs, up to 1 million per session. Euphausiacea can lay about 1 thousand per year, though this may vary. Shrimps can only live up to 2 years in maximum, and that’s why they reproduce faster. Euphausiacea has a longer lifespan of up to 10 years, that’s why they only reproduce slower. Shrimps eat both animals and plants, making them omnivorous. Euphausiacea are vegetarians and only eat algae and plankton. They are, however, one of the favorite food of various large fish such as dolphins. Shrimp can be threatened by overfishing and natural extract spills. Euphausiacea is threatened by the same manner as shrimp. Q: What are omega 3 fatty acids and its benefits? The most important reason why omega 3 fatty acids are good for your health is because they can potentially help prevent heart diseases from happening. Both fish natural extract and euphausiacea natural extract have this component. If you have joint pains then you should definitely take omega 3 fatty acids because they can help boost the healing of your joint pains, especially if you have terrible arthritis at hand. Those with problems in depression, mood swings and the like can definitely use omega 3 fatty acids on their foods like fish natural extract and euphausiacea natural extract as a herbal productary action for antidepressants. It can also help those with bipolar disorders and other behavioral disorders. As we have mostly seen in infant formula commercials, DHA that is present in omega 3 fatty acids can help a child’s brain development so that they will get better understanding when they grow up and develop, and that their learning process will be easier. Those with ADHD, a kind of attention or behavioral disorder in most children and adults, can get some help from omega 3 fatty acids products. It helps their concentration, thinking and their calmness. Those with asthma can benefit from omega 3 fatty acids because of its anti-inflammatory properties. It is also known to help your lungs to breathe more properly. If your grandma or grandpa is suffering from any of these memory problems, omega 3 fatty acids can definitely help them out due to the DHA content. Q: What are the side effects of euphausiacea natural extract? Those who are breastfeeding and pregnant may need to watch for the use of euphausiacea natural extract in general and consult their physician or ob-gyne for this. Some people are allergic to seafood, and this is what exactly the euphausiacea natural extract is made of. So, if you do have seafood allergy in general, it’s best to avoid euphausiacea natural extract altogether. Blood clotting problems can potentially happen if you normally intake euphausiacea natural extract before and after a certain surgery, so it’s best to leave it out if you are planning to have a surgery in one way or another. Q: How is euphausiacea natural extract better than fish natural extract? A study in 2007 said that with euphausiacea natural extract, as compared to fish natural extract, there is much better possibility in terms of arthritis reduction. A study in 2011 said that with euphausiacea natural extract, as compared to fish natural extract, there is much better evidence of heart health improvement for euphausiacea natural extract. According a study in 2003, there were more PMS symptom reductions for euphausiacea natural extract than fish natural extract. Majority of the studies also conclude that because euphausiacea are vegetarians, they won’t have any harsh metals as compared to fish. Q: What do euphausiacea like to eat? A: The euphausiacea diet is mostly made up of zooplankton, phytoplankton, algae and many other veggies in the sea. They mostly hunt for food in the darkest parts of the sea, which is about 100 meters in depth or 320 feet on the average. They try to get away from whales and most seagulls so that they can eat without much threat to their lives. They often go to the surface only at night so that they look for phytoplankton to eat. They have an amazing stomach – being able to fast up to 200 days (how amazing is that?). Q: What is a soft gel? A: A soft gel is a kind of encapsulated medication or herbal product that contains either herbal or lab made medicine or herbal products. Soft gels are super easy to digest and they work faster than most tablets. The wedge that is seen in a soft gel is how it was sealed during the production process. Q: What are the benefits of soft gels? 1. Its distinct shape and flexibility makes it easier to swallow than tablets. 2. They are the best medium for natural extracts like fish natural extract and euphausiacea natural extract. 3. Heat won’t easily affect them when they get transported. 4. Stomach upsets get reduced with them, according to studies. 5. For those with problems on tablet coatings, soft gels offer an alternative. Q: Why are food herbal products becoming popular? Most celebrities and social media influencers have posted a lot and raved about how the latest diet crazes and fad diets, as well as the use of health herbal products, could change their lives, and this prompted their followers and many other people to do the same. Long gone are the days when makeup brands are just makeup brands – some of them are now actually coupled with green tea, Aloe Vera, natural natural extracts and whatnot. The beauty industry is slowly going herbal as well for health purposes. Millennial people have been different from the past generations because they are just more naturally conscious with their health, learning from the past eras when obesity was not a big focus yet. Q: According to studies, what are the common reasons why people take food herbal products? EPA stands for eicosapentaenoic acid, and is known to boost the cognitive functions of a person, especially during child and developmental stages. EPA is also a good countermeasure against mental health problems like depression and cognitive problems like dyslexia. DHA stands for docosahexaenoic acid, and is known to boost a child’s learning and performance, as well as understanding, during their childhood and developmental stages. This is why many infant formulas are marketed with DHA to improve their brain performance. Q: Is euphausiacea natural extract a good source of mood boosters for fighting depression? A: There is a certain study that shows that there is a significant difference in the mood of a person when they take euphausiacea natural extract herbal products, especially if they feel sad or depressed. The study concludes that there are certain effects with depressive disorders, such as major depressive disorder, or simply depression, that can be influenced positively by omega 3 fatty acids from euphausiacea natural extract. Q: What other food items have omega 3 fatty acids? Q: If I’m a vegan but I want to consume products with omega 3 fatty acids for better health, what are my choices? Algae can be used for preparing certain foods, or you can find them in capsules. Seaweed is a favorite for most Japanese cuisine. Certain plant sources like pumpkin seeds, walnuts and flaxseed can be made into desserts and can be a great source of EPA and ALA.
Certain plant natural extracts like flaxseed, perilla, pumpkin, olive, soybean and canola natural extracts are great for vegetarians and vegans alike. Try veggies like collard greens, spinach, cauliflower, broccoli and kale. Try fruits like the winter squash and the papaya. Examples of great omega 3 fatty acid rich legumes include soybeans, pinto, hummus and chickpeas. Q:What are the benefits of astaxanthin? 1. It can help with joint problems. 2. You can use it to alleviate heartburn. 3. It is also helpful for a healthier skin appearance. 4. It is a natural anti-inflammatory component. 5. You can use it alleviate fatigue. 6. It may also boost your immune system. 7. You may also get cardiovascular and brain health boost. Q: Which foods have astaxanthin? 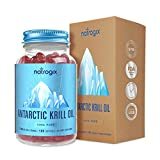 As a whole, we think that the Viva Naturals is our pick for the best krill oil supplement, due to the EPA and DHA content, the significant amount of krill oil per bottle, the omega-3 fatty acids that are present in the product, and all of its benefits, including the ease of swallowing for better heart health, brain function and joint problem relief as well.